The steel WTP, restored by NWC. 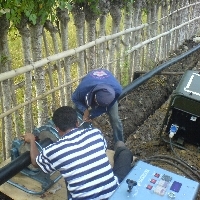 NWC laid 6km of HDPE piping. CHALLENGE. 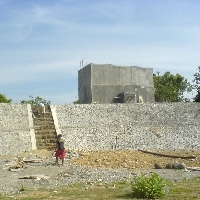 Laweung is a small village on the northeastern coast of Aceh province that suffered extensive damage from the tsunami of 2004. Among its problems was a decrepit water treatment facility. Residents were forced to obtain water for drinking, bathing and sanitation directly from the local river. RESULT. The contract was completed within budget and on time. 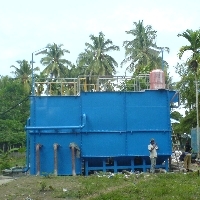 Laweung villagers now have access to clean water from a water treatment plant operating at a capacity of 20 l/s.